“Millard uses a 25x22mm (1in x 0.8in) and 25x25mm (1in x 1in) aluminium channel frame. 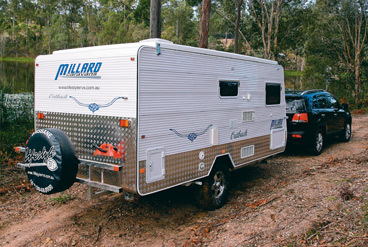 Millard has used aluminium framing for almost five decades, which speaks for itself when you see the number of very old Millard caravans still going strong. “We choose to rivet our frame sections together, rather than weld them, as this saves weight and allows the frame to flex as it travels over rough roads. “Millard has chosen to stay with the aluminium frame because of its three main advantages over timber: it’s substantially lighter; has increased strength, especially at the joints; and eliminates the possibility of rotting wood problems in the frame, which means a longer life and lower maintenance for long-term owners. “The disadvantage to the manufacturer is that an aluminium frame is much more costly to produce, both in labour and material cost. Our frames are not pop-riveted together. We hollow the sections, allowing the longitudinal and cross members to meet each other and give greater support than the average frame. We also place grommets within the frame to run the electrical wiring through safely. “We place full aluminium framework around the fridge vents and windows and then insert timber into the aluminium to give added strength to the frame when these are screwed into place. “We use aluminium for our three models, with two different wall widths. The Cross Country is built for a mid-size 4WD with standard width walls, while the All Terrain Vehicle and TopEnder models are dedicated to remote travel and feature increased wall framing for added strength. “All frames are interlocked and secured with a solid high tensile pin-punch. This allows for the slightest amount of movement (to minimise any chance of the frame cracking), and makes for a stronger structure. “The frame sits on the chassis cradled into a Z-channel outer section, secured by ‘Huck’ bolts through galvanised plates, frame and chassis, both downwards and sideways. “The aluminium roof is welded together and dropped in to become the base structure to build from, rather than other methods where furniture is the base. 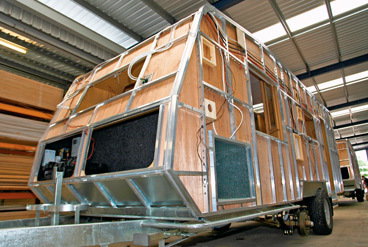 “Designer Vans has been building vans for more than five years and provide a mixture of timber frame for their offroad units and composite walls for the touring vans. 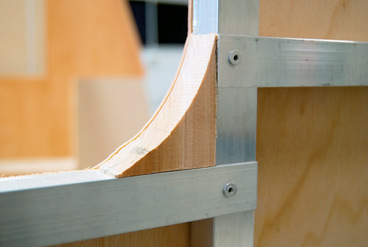 All our timber frames are glued and screwed, not stapled. We use timber because it provides extra strength and better fixing. We bolt the overhead furniture in place and screw the base furniture to the timber frame and floor. The way the walls are fixed to the chassis is also important and that’s why our walls are bolted not screwed, to give extra support. 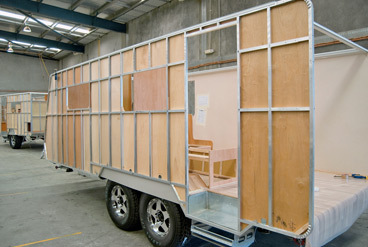 “Jayco’s frame consists of five major ingredients which, when vacuum bonded, allow increased strength and detail when compared to conventional aluminium clad caravans: 19x19mm tubular aluminium outer frame; and four vacuum-bonded layers comprising fibreglass, ply (internal and external) and polystyrene foam.